A while ago I wrote an article about Adaptive Display and how it can be fine tuned. Well Adaptive Display as we know it hasn’t seen the light for a very long time because a lot has been changed in XenDesktop 7. 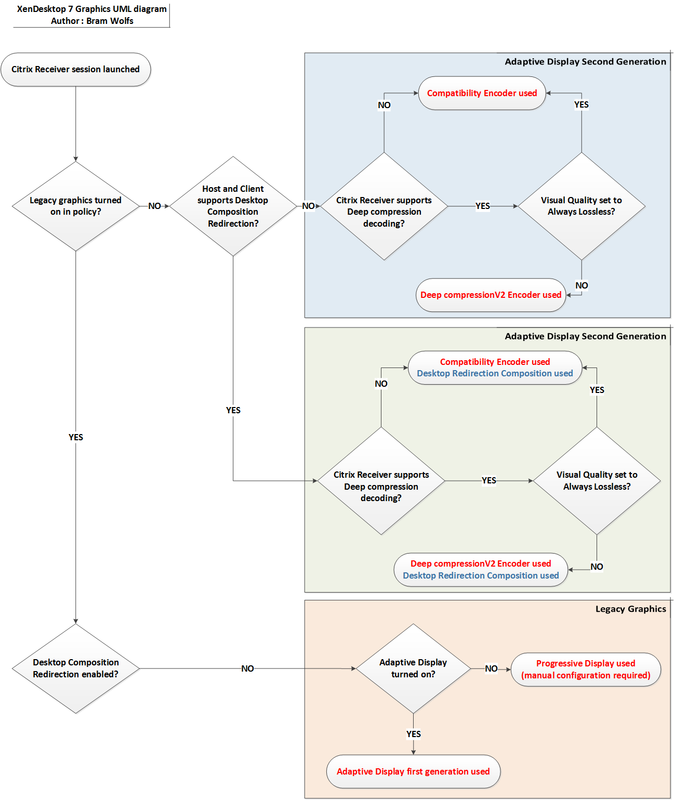 In this blog post I will describe this changes and dig deeper in the configurable options related to graphics in XenDesktop 7. In a short time frame a lot have changed in the delivery of graphics, users are demanding more media content, higher frame rates and a fluid user experience. While Progressive display did a very good job for a long time, it required a lot of manual tuning to accommodate different use cases, because of this it was often misconfigured resulting in a degraded user experience. To overcome this problem Citrix developed the first generation of Adaptive Display, it was still based on settings around progressive display but it was now auto tuning according to the available bandwidth and the capabilities of the client device. The concept of this first generation was simple : use a different compression algorithm for moving images and still images and tune it on the fly. I think the above settings are the most important changes in XenDesktop 7 according to graphics, besides that there are a lot of windows media related policies added. There is nothing really arranged what’s current and what’s legacy so it’s easy to get lost if you don’t know where Citrix came from with Adaptive Display first generation and beyond. You can only see on what kind of OS it applies but that’s about it. Citrix was the first vendor to use H.264 compression for delivering graphics through their remote display protocol (ICA), it was targeted for a specific use case : 3D modelling and graphics designers. At the beginning the first version of this codec was only available when combined with Nvidia GPU cards that had enough Cuda cores, as the codec was designed to leverage the Cuda cores for compression and encoding. Desktop Composition redirection together with the new compression codecs forms the base of Adaptive Display second generation. It’s a combination that’s default enabled when connecting from a windows Client. If you use this combination you have to keep them both in mind when fine tuning the user experience. For example you configure the visual quality to always lossless to prevent lossy data send to the client (for medical purposes for example). You will still see lossy artefacts like the below example in Wordpad. To get a really lossless experience you have to either disable Desktop Composition Redirection or set the graphics quality of Desktop Composition also to lossless, increased bandwidth consumption needs to be taken into account of course. 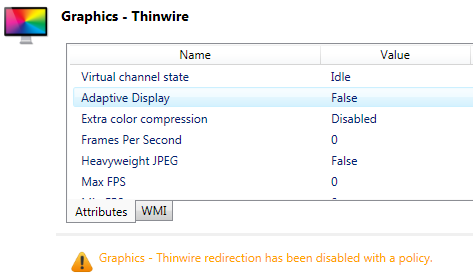 When you use the default graphics settings in XenDesktop 7 and you open HDX Monitor, you will see under Graphics – Thinwire that Adaptive Display is disabled (see below screenshot) and that thinwire redirection is disabled by a policy. This means that you are leveraging the new codecs and not using Adaptive Display first generation. 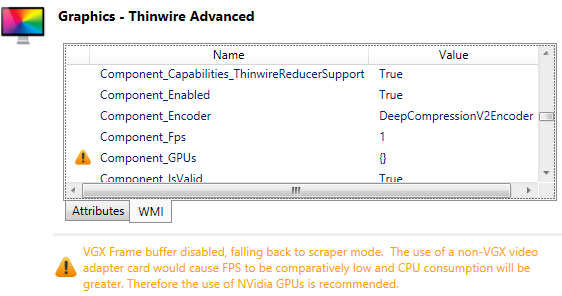 When you look at Graphics – Thinwire Advanced you will notice that the Legacy Graphics mode is turned off with the Legacy Graphics mode policy (see below screenshot). For further fine tuning the legacy graphics mode in XenDesktop 7, read my previous blogpost on Adaptive Display. Leveraging the GPU directly is available for a while now but since it’s a one-to-one solution (except when using hosted shared desktops, where you can share a GPU with multiple sessions on the same server OS) it’s not very scalable and mostly limited to be used for heavy graphical designers and alike use cases. VGX on the other hand will extend the use cases by delivering a one-to-many solution. Personally I think this is the future because it provides the best combination of scalability, bandwidth and user experience. Let’s dig a bit deeper in VGX. When you have a GPU available graphics are first rendered on the GPU before they are (deeply) compressed in CPU and then send down the client, so first the output of the GPU (which would normally be send to the monitor attached to it) needs to be captured and after that compressed and tuned, this process is called screen scraping. So when you want to leverage the GRID virtualization technology you can do this for about 100 “normal” task users on a single GRID card (this can be less or more depending on the type of card and type of users), in this way you can already build a high scalable solution for general use cases. For more heavy graphical demands you need NVS USM or Quadro USM and this will cost additional licenses, good thing is you can mix and match the USM’s on a single GRID card. Of course the limits of the GRID card needs to be taken in to account. 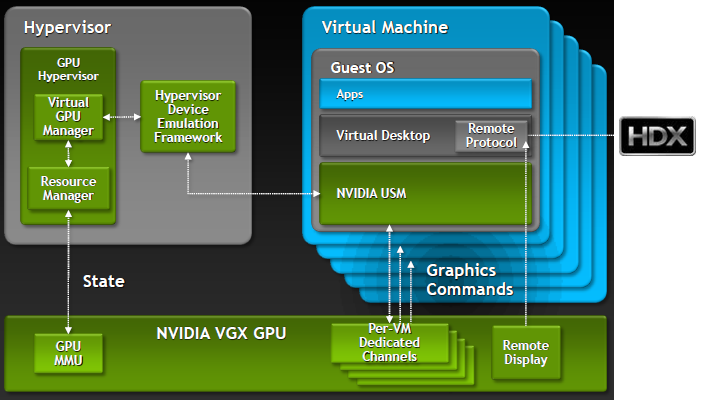 For more information about Nvidia GRID and the USM use cases click here. XenServer will be the first hypervisor supporting GRID GPU virtualization, at this time of writing it’s not yet available but you can already order servers with GRID cards and leverage the onboard kepler GPU’s by using traditional GPU passthrough technology. – USM is now called VGPU Profiles, where K100 profile being the lowest which supports a maximum of 32 VGPU’s per board (K1 Card) and K260Q being the highest, which supports 4 Power Users (designers) on a K2 Card. – In the following table you will find the maximum VPGU per card. – Cannot find anything on licensing, it looks like the above hardware limits are the only limitation in the tech preview. In this blogpost I described the new graphics options and choices you have in XenDesktop 7, remember that you don’t have to configure anything to get an awesome experience out of the box. The CPU based deep compression codec is really a giant leap forward compared to the first generation of Adaptive Display especially when it comes down to mobile user experience and WAN use cases. As more Citrix Receivers supports the new codecs it’s really a fluid experience across a broad range of devices. But keep in mind that you need additional resources on your host side compared to the “legacy display mode”. Personally I had the best experience with the visual quaility set to Build to Lossless and disabling the desktop composition redirection feature, of course this depends on the use case, what I primary tested was server rendered video (youtube) and the look and feel of the desktop over a high speed WAN connection. What also amazed me was the look and feel of Windows 8 on the IPAD with receiver 5.8, they really made a big step forward making it a native mobile experience and playing video content really performed very well using the new codecs. Can we safely say that Adaptive Display first generation and progressive display become absolete? Yes I think so, but for now there is still a valid use case : for example, when you want to get high density numbers and you have primarily LAN users Adaptive Display first generation still gives you the most scalable solution, but as CPU’s become faster and when GPU’s with GRID technology become more mainstream (also for general use cases), I think we can say goodbye to the good old progressive display after all those years.